The Ordinary 100% L- Ascorbic Acid Powder is a very fine, anhydrous powder and it has to be mixed with other skin treatments (creams or serums). It provides the most direct exposure of extremely high concentrations of vitamin C topically. You can mix a small amount of powder with other skin treatments in the palm of your hand and apply to the face, a tingling sensation might occur during the first 1 or 2 weeks of use. It targets the same skin concerns as Hylamide C25 serum.Vegan, cruelty free,oil free, alcohol free, silicon free, water free, gluten-free, nut-free. Pixi Vitamin Wakeup Mist with orange blossom, citrus extracts, lavender and arginine. This is a boosting treatment toner that can be used before moisturizer, after makeup, and basically any time of the day when you need to cool, add hydration, refresh and add a protective veil to your skin. Very soothing, leaves skin refreshed and radiant. Cruelty free. Holika Holika Honey Sleeping Pack Acerola, this is a sleep in moisturizer mask, rich in honey, vitamins and essences. It has 20% vitamin C and the texture is almost like real honey but less sticky. It makes skin supple and plump overnight. Improves skins vitality and elasticity, gives a natural glow and its highly moisturizing. Maximum skin absorption of vitamin c occurs at 20 % strength, increasing the concentration beyond this limit will not provide better results as skin will not be able to create a better absorption and the risk of creating skin irritations might occur. When using vitamin C concentrated skin care is best to avoid retinol, glicolys, saliclilyc and lactic acid. Go easy on Vitamin C if your skin is sensitive! My favorite vitamin.. C, This will surely help us take care of our body more and yes especially the skin. Thank you for raising some of the details in here. I thought would be great if I mention some important things like how and when to use it to make it effective and avoid skin irritations.I hope this was helpful! Samantha, I am really sorry if I made your list a bit longer :) but I am really happy to hear you will look into it ! These all sound like lovely products. I try to use Vitamin C as often as possible on my skin. The wakeup mist sounds lovely, must smell great! I am addicted to that wakeup mist, smells very uplifting and feels so refreshing ! Nice! I use Body Shop Vit C serum and love it thus far. This is my first time using a serum and I love the feel of my face since using it. So nice Kemi!I am also going to order that one from The Body Shop soon,I love their products ! 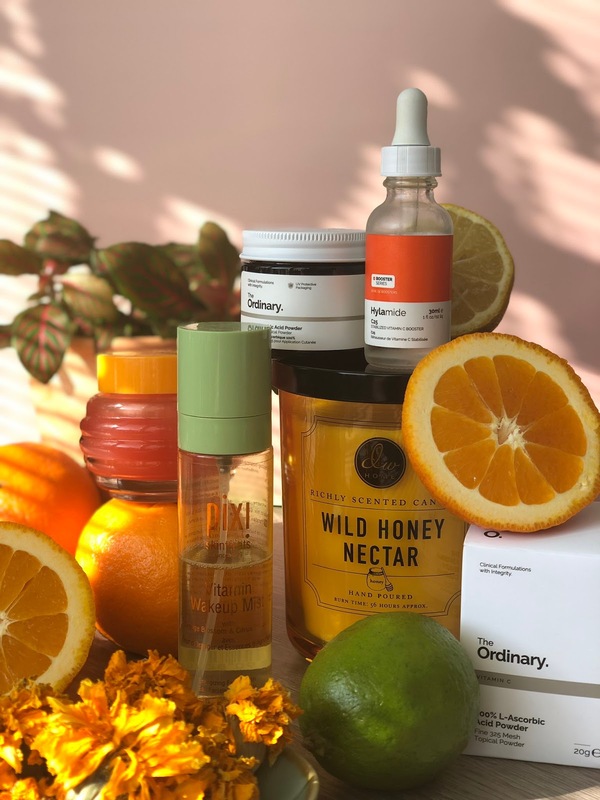 Vitamin C is such a holy grail skincare product especially because of its radical-fighting properties. I'm glad you've shared that it's not to be used with retinol. Now I need a Vitamin C serum. I am so grateful to read that post. Since I started working from home, I tend to neglect my skin care and it's time to go back to the good habit and starts incorporating Vitamin C in my daily regimen. I never heard of these products before nor how Vitamin C will make my skin bright and healthy. Thanks for the new info! I am happy this was useful to you! I cannot agree more. I'm a big fan of Vit C serum too. I just so love the feeling once you apply it to your skin. Not only healthier but also protected. I agree vitamin c is really good for our skin. I would love to try few products from this range.